During a presentation on TS Eliot, his poetry and his spirituality, I referred yesterday [7 November 2015] to the Irish background of the family of his wife Vivienne Haigh-Wood, and how some of their wealth came from a terrace of houses in Dun Laoghaire, and I referred also to his friendship with James Joyce, which lasted for the best part of two decades. It seems natural then, at the end of a long working weekend, after our closing Eucharist and a light lunch, that two of us should spend the afternoon visiting Haigh Terrace in Dun Laoghaire and the Joyce Tower at Sandycove. On a rainy, wind-swept afternoon, it is possible to miss Haigh Terrace altogether. One side has humdrum modern apartments and a side entrance to the Royal Marine Hotel, the end is closed off with bollards to create an artificial cul-de-sac, and the side lined with the houses built by the Haigh family is better known for the former Kingstown Mariners’ Church, now the National Maritime Museum, at the end of the sloping avenue the looks out to the sea. Some of the once-elegant Victorian houses on Haigh Terrace are now divided into flats, with multiple doorbells at the front doors, while others have been spruced up in recent years, and the original name recalling the Haigh family is still carved into the corner of one house. However, there is nothing to indicate that this terrace has any connections with TS Eliot and Vivienne Haigh-Wood who were married 100 years ago in 1915. At the end of the terrace, the former Mariners’ Church was built by subscription in 1836, after £1,000 was given as endowment for a church for seafarers to be known as the Protestant Episcopal Mariners’ Church at Kingstown Harbour. In the 1830s, the town and harbour of Kingstown were growing in social and commercial importance and a need was identified for a church to care for the spiritual needs of officers and sailors. In 1862-1867, the spire designed by Raffles Browne and the lancet windows were added, and the chancel was added in 1884. There were further renovations in 1870, and again in 1884, under the direction of the architect Thomas Drew (1838-1910). During this work, a plasterer working on the ceiling died when the scaffolding collapsed and his colleague was seriously injured. The church reopened in 1884, but the congregation dwindled in the last century, and the church for worship at Easter 1972. In 1974 the Maritime Institute signed a lease on the church, and the National Maritime Museum was opened by President Patrick Hillery in 1978. From Dun Laoghaire, we drove on through Glasthule to Sandycove and parked close to “the Forty Foot” and the little sandy cove that gives this village its name. This was my first time to visit the James Joyce Tower and Museum, housed in a former Martello Tower built in 1804. The tower is the location of the opening passage of Ulysses and houses a museum with letters, photographs and many of the personal possessions of James Joyce. This is Sandycove’s main attraction, and it has survived recent threats of imminent closure. But the ‘Friends of Joyce Tower Society’ were formed and came to rescue. The tower is now open to the public every day, with volunteers on hand. Visitors number around 150-200 a day in summer and 50-60 in the winter season. The tower is about 40 ft high with walls 8 ft thick. It was demilitarised in 1904 and put up for rent by the War Department at £8 a year. The first tenant was Oliver St John Gogarty, a medical student and budding poet, who moved in in August and invited the James Joyce, then a 20-year-old to join him. Joyce arrived at the tower on 9 September, and they were joined by Samuel Chenevix Trench, an Oxford friend of Gogarty’s. But Joyce’s stay was brief. He was chased out of the tower on the night of 14 September and never returned. A month later he left Ireland for a literary career in Europe. The first chapter of Ulysses, published in 1922, is set in the tower with characters based on himself and his companions and with the implication that he had paid the rent. As a result the tower became his monument despite the fact that Gogarty had been the tenant and had been visited here over the years by many celebrated Irish personalities and literary figures. The tower was bought in 1954 by the architect Michael Scott. With the help of a gift of money from the filmmaker John Huston, he and his friends set up the James Joyce Museum which was opened on 16 June 1962 by Sylvia Beach, the first publisher of Ulysses. Over the years the museum collection has grown thanks to the generosity of many donors. In 1978 an exhibition hall was added to the building and a new entrance put in at ground level. From the top, there are views to Dalkey and Dun Laoghaire, and out across Dublin Bay to Howth. When we climbed back down, there was a half rainbow in sky, a few swimmers in the water at the Forty Foot, and the sun had come out again, shining across Dun Laoghaire and onto the small sandy cove at Sandycove, below the Joyce Tower and Museum. As Remembrance Sunday is being marked this morning [8 November 2015] throughout these islands, I remember my grandfather, Stephen Edward Comerford (1867-1921), who suffered through Gallipoli and Suvla Bay with the Royal Dublin Fusiliers 100 years ago in 1915-1916, who was sent to the Balkan front from Greece, and who then picked up malaria in Thessaloniki. After my grandfather was sent back to Dublin, my father was conceived and was born in 1918. But my grandfather’s health continued to decline until he died a pitiable, sad and lonely death on 21 January 1921. He was only 53. He is buried in Saint Catherine’s Old Churchyard in Portrane, Co Dublin. He came to mind again two weeks ago [23 October 2014] as I spent some quiet time in reflection in the War Memorial Garden in Lichfield. 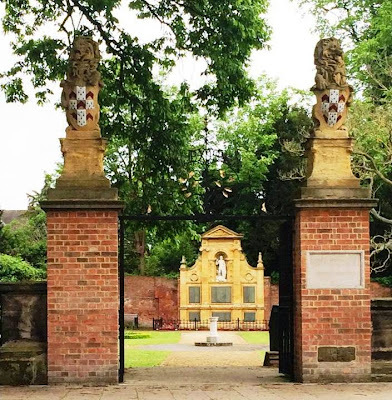 I am always impressed that this garden, a peaceful oasis in the shadow of Lichfield Cathedral, is a reminder of war and its consequences, and never a glorification of war – instead, over its gates in large letters the inscription reads: ‘PAX 1919’. After World War I, the people of Lichfield were anxious to create a memorial to local people who had died during the war. The site was chosen because of its picturesque setting between Minster Pool and the Cathedral Close, with the three spires of Lichfield Cathedral in the background. From the early 1300s until the mid-18th century, a crenellated wall surrounded the Cathedral Close and formed part of the cathedral’s fortifications, and this wall passed through the centre of the site of the Garden of Remembrance. Over time, as parts of Minster Pool silted up, the f land where the garden now stands doubled in size and by 1738 it was leased out for cattle grazing. Three projects were proposed at the time: peace celebrations, a permanent war memorial, and an assembly room for concerts. A public appeal was launched to raise money to build a permanent war memorial. The War Memorial was designed by the architect, Charles Edward Bateman (1863-1947), who was born in Castle Bromwich, about 15 miles south of Lichfield. He was an early pioneer of the Arts and Crafts style in Birmingham and the surrounding area. He built a series of large suburban properties, with particular concentrations in King’s Heath, Four Oaks and his native Castle Bromwich, along with more urban offices, factories and townhouses in Birmingham City Centre. The memorial is the work of the Lichfield stonemasons, Bridgeman and Sons of Quonian’s Lane, and work on laying out the garden began in 1919. The stone lions on the gate piers reputedly came from Moxhull Hall in Wishaw, Warwickshire. The 18th century stone balustrades and plinth came from Shenstone Court, south of Lichfield. 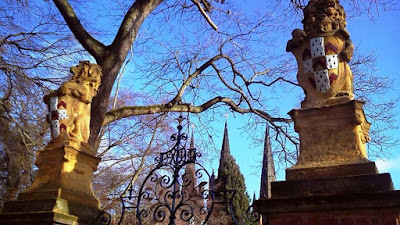 Kate Gomez of Lichfield Discovered and Joss Musgrove Knibb, Deputy Editor of the Lichfield Gazette, have pointed me to a sandstone block carved with a cross and embedded in one of the gate posts of the Garden of Remembrance which they have identified this as a surviving boundary stone. At the far end of the garden, the war memorial is built in the classical style with Ionic pilasters flanking the statue of Saint George and the Dragon in the central niche. To either side of this central section are panels with swept parapets carved with wreaths topped with crowns. The life-size figure of Saint George is carved in Portland stone, the monument is of Ashlar stone, and the plaques are of Westmorland slate. Saint George, who stands astride the dragon he has slain, holds the cross in his right hand and with his left hand he supports a shield emblazoned with the cross. There is a long tradition, dating back to the beginning of the crusades in the 12th century, of depicting Saint George as a knight slaying a dragon. The statue in Lichfield shows Saint George as a proud, youthful and alert warrior encased in armour. This depiction is influenced by Donatello’s standing figure of Saint George for the Orsanmichele or Oratory of Saint Michael in Florence (1416-1417). The design is also influenced by the 16th century statue on the façade of San Giorgio Maggiore in Venice by the sculptor Giulio dal Moro, where Saint George stands with a staff in his right hand and a shield in his left, and with the slain dragon at his feet. The Garden of Remembrance is owned and managed by Lichfield City Council. It forms part of the Grade II-registered Cathedral Close and Linear Park. The garden was restored in 2011/2012 as part of the Historic Parks restoration project. The foxglove tree in in the garden is a magnificent, ornamental flowering tree. The foxglove tree is a native to China and was introduced into Britain around the 1830s. The fragrant, mauve, bell-shaped flowers open in late Spring if the buds have not been damaged by winter cold in the previous months. The tree grows rapidly in its younger years and thrives best when it has a large amount of light and good shelter. Another memorial to the employees of Lichfield Brewery who took part in World War I can still be seen on the old brewery buildings in Upper Saint John Street, Lichfield. Outside Lichfield, the National Memorial Arboretum at Alrewas is on the edge of the National Forest, and is a year-round centre of Remembrance. The maturing woodland landscape is home to over 300 memorials. This morning, let us pray that we may find the ways needed to put all wars behind us, to put aside all hatred and violence, and when we remember that we remember with sorrow, with gratitude and with forgiveness, but without bitterness or anger, that the call of nationalist ideologies may never twist us, may never distort the love we should have for others, nor ever allow us to deny our shared humanity.